Marcia Woodard makes it adamantly clear that her role as Director of the Montgomery Zoo has a lot of perks. “Where else could I work where my backdrop is a large backyard full of exotic animals? Sometimes I have to punch myself to realize this is my job.” Woodard said.. Originally from Ohio and a graduate of Youngstown State University, Woodard has held various roles that have led her to her current position. 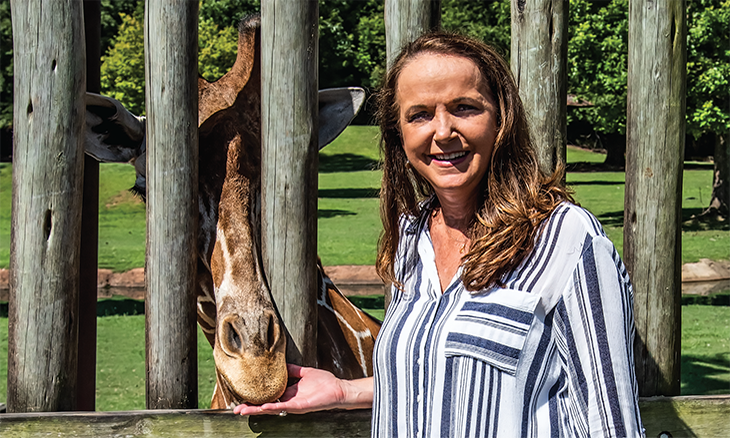 She worked six years as the International Marketing Director for Flambeau Products and also spent time working as a server during high school and college — a building block that helped her assume the role with the zoo. Woodard came to the zoo twenty-plus years ago as the Marketing and Public Relations Manager and subsequently moved on to different roles before taking on the role as Zoo Director in April of this year. She participates in the Montgomery Chamber of Commerce Tourism Committee and has served as chairman of the Trustees Board at Saint James United Methodist Church. ALMetro360 was lucky that Woodard found the time to take us deeper into the world of animals at the zoo in her role as zoo director. ALMetro360:Tell me a little about yourself? Where from? Background. Education. What led you to Montgomery and to the Zoo? How many years at the zoo and how many positions held? Woodard: I am originally from Northeast Ohio. I moved to Montgomery in 1992 when I married my husband. So I am a transplant but I do consider Montgomery my home now and a true southern girl. I have a Bachelor’s degree in Business Management from Youngstown State University in Youngstown, Ohio. I came to Montgomery because this is where my husband was living when we got married. I began working for The Montgomery Zoo in October of 1994 as the Marketing and Public Relations Manager. In 1998, I was promoted to the Assistant Zoo Director, Administration, in 2001 I was promoted to the Deputy Zoo Director position and then in April of this year I was named the Director of the Montgomery Zoo. ALMetro 360: Was becoming zoo director a vision or a happy accident? Woodard: Once I began working at The Montgomery Zoo I quickly fell in love with working at a Zoologically Facility. I knew at that point that one day I would love to become a Zoo Director. Every day I come to work loving what I do! It is a pleasure to work doing something you love! Also, having a great team of employees is a plus. ALMetro360: Since the director’s retirement what is (was) ﬁrst on your agenda? Woodard: I have been working on improving communications with our staff and zoo visitors. I am passionate about delivering excellent customer service to the public. Recently, I enrolled 14 staff members to go through Montgomery Hospitality Academy that is a three-step training track held at the Troy Montgomery Campus. Everyone that works at the Zoo is in customer service/hospitality and going through training sessions should improve the skills of our staff members. 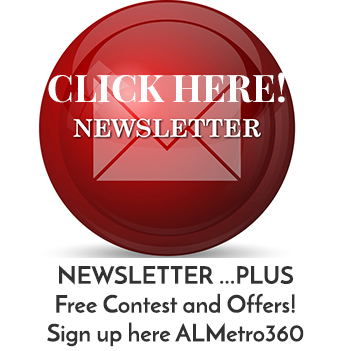 ALMetro360: Any new construction projects/displays lined up this year or next? Woodard: Currently we are raising funds for a new Reptile Facility. We opened Stingray Bay earlier this year. ALMetro360: What are the top 5 priorities moving forward? ALMetro360: What is your involvement with the animals? Woodard: We have a team of awesome Zookeepers that take care of the day-to-day care and husbandry needs of the zoo animals. We also have a Veterinarian, Veterinarian Intern and Veterinarian Tech. that handle the medical needs of our animal collection. My involvement with the animals is searching and determining new species that we want to exhibit as well as sending animals to other facilities for breeding purposes. I have a big picture mentality for managing the collection. ALMetro360: What are some challenges you face? Woodard: Some of the challenges we face are desiring to bring additional animals into our collection but not having the funds to build new exhibit spaces. Also, we rely on our community to provide repeat visits to the zoo. Therefore, we must always strive to provide new offerings in order to keep them coming back. ALMetro360: What are new opportunities that you are tapping into for doing business at the zoo? ministering the zoo’s budget, the zoo was earning 30% of their budget and the City was providing 70% of our budget. Over the years we have added attractions to the zoo that allowed us to completely turn the tables where the zoo now earns 70% of the budget and the City provides 30% of our budget. Being diligent in how we monitor and administer the budget along with the addition of extra in the park attractions (skylift, giraffe encounter, petting zoo, parakeet cove, paddle boats and the new stingray bay) has allowed us to accomplish this feat! ALMetro360: What is the process of attaining animals for the zoo? Woodard: Most zoos belong to Zoological Associations. Through these associations we are able to post surplus and desired animals. Most zoos offer breeding loans, loans and purchases. If the animal is an SSP (Species Survival Plan) animal then they are paired with other animals based upon the genetic makeup and if the species should be breeding. In the case of SSP animals there are SSP Coordinators that determine where the animals are placed. ALMetro360: How is the zoo different now versus when you ﬁrst started twenty years ago? Woodard: Now the emphasis on zoos is to offer more interactive experiences to the visitors. This is why we added our Giraffe Encounter where you walk out on a bridge and get up close and personal with the Giraffe. We also added the Parakeet Cove where you have the opportunity to feed the Parakeet. Just this year we opened Stingray Bay where you have the opportunity to feed the Stingrays. Providing these interactive experiences to our visitors leaves them with a connection to wildlife that one does not get through just viewing the animal. 2. What’s your favorite zoo experience now, when you were a child, or both? 3. What can we expect this upcoming season? 4. What do you think is the crowd favorite at the zoo/exhibits is? 5. What’s the zoo’s goal the next 5 years?